It’s time for a new NGY sponsored game! Everyone can play along, no yarn/fiber requirements however, using Nerd Girl Yarns is always encouraged and there are perks to doing so! We are giving everyone a little heads up so there is time to plan and gather supplies. To play along you only need to knit, crochet, weave or spin something for someone else between midnight CDT on October 1st, 2014 and midnight central time on November 30th, 2014. This can be a gift, something someone requested that you make for them, something you just want to make for them, or an item for charity. Since we are playing on Ravelry they must be a Ravelry craft and knitted, crocheted, woven, handspun or a combination of these. For each qualifying entry Nerd Girl Yarns will donate $1 to Project Linus. For each qualifying entry made with at least 50% of NGY yarn or fiber, Nerd Girl Yarns will donate an additional $2 to Project Linus for a total of a $3 donation per qualifying entry up to a maximum NGY donation of $250 (which equates to approximately 250 non-NGY entries or 83ish NGY entries). Games are more fun with themes & teams! To create a team just find at least one other person who shares your interest in theming their projects, give yourselves a name, and create your items to go along with your theme. For example, Langwidere and I both love Stephen King therefore we might create a team called Team Chester’s Mill and craft mittens to be donated to charity. In our entries we might post about how they would be fitting to be worn by the folks Under the Dome. Teams do not need to make the same thing nor do they need to gift/donate to the same people/charity (i.e: On Team Baker Street player #1 may make a scarf inspired by Sherlock but player #2 may make a hat inspired by Watson. Each player may donate/gift to the person/charity of their choice). Three prizes will be drawn from the entries at the end of the game via the random number generator at random.org. A limit of one prize per person, if an entrant has entered multiple things and the random.org generator chooses them a second time then the generator will be run again until a unique entrant is chosen. Prizes include: $25 gift certificate for Nerd Girl Yarns, a hand dyed jersey cotton scarf from Nerd Girl Yarns (winner will be able to choose from a gallery of items in stock at the time of award), and a skein of yarn from Nerd Girl Yarns (winner will be able to choose from a gallery of items in stock at the time of award). People can be on as many teams as they would like but each entry can only be used for one team. If playing as a team, items turned in for entry to the game must be themed to the team. Teams do not need to synchronize items or entries, each person can make whatever they want and gift/donate to the person/charity of their choice, but the item must match the theme of their team. There are no requirements to play alone however, playing as a team can be a really rewarding and fun thing! You don’t need to know anyone in person to play on a team! You can play as a team, multiple teams, and individually. How you turn in items (team themes or individual themes) is up to you but each item you submit can only be submitted once. Items made must be themed to the team you are submitting it as if applicable – be creative. Items must be made for someone else or a charity, they must be given away. You must describe the item made, show it off and tell us about it! If using 50% or more of NGY, you must specify the yarn/fiber used. Spinning is allowed but the handspun must then be given away or crafted into something to be given away. Christmas gifts are allowed, the item doesn’t have to be gifted right away. Items must be started and finished within the eligible timeframe of the game. No WIPs allowed. Items made from handspun may be used from existing handspun however, the handspun itself won’t count as an entry as it wasn’t spun during the timeframe of the game. Recipient of Item (you do not need to use their real name and if it is a secret then you can PM linuxchic this info). If this is for a donation, please name the charity or group it is being donated to. Description and photo of item (include how your item goes with your team theme if applicable). Project Linus collects handmade blankets and distributes them to children in need. As makers of hand dyed yarn we really like the handmade part. 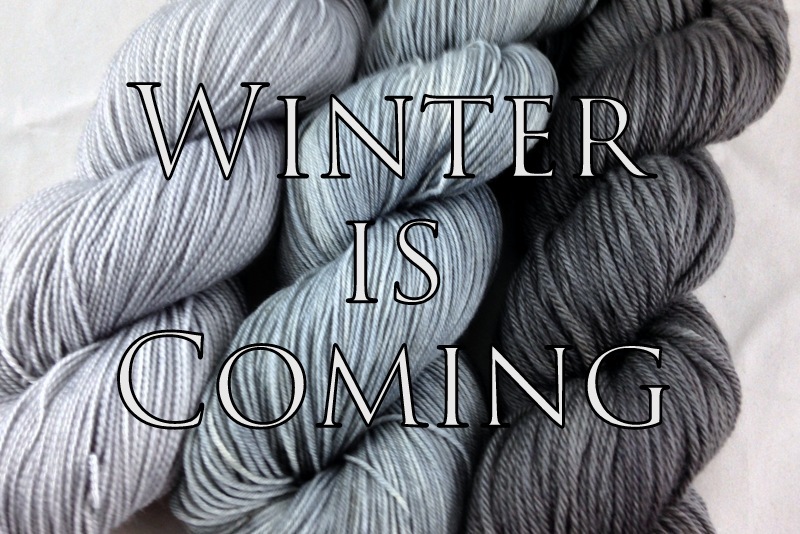 Project Linus distributes warmth and here in the northern hemisphere, winter is coming. Why not donate based on sales? First, by setting it up as per entry instead of per sale even someone on a yarn budget can donate to Project Linus just by playing along. We would love to see an increase in sales for the game so that’s why we are donating more for entries that are using at least 50% Nerd Girl Yarns yarn or fiber. Clubs would be excluded from traditional sales so this way our club members can use their club yarns and fibers and still know that a $3 donation is being made to Project Linus for each of their entries. For customers who decide to use their NGY stash, it’s like making a retroactive donation. Second, we are makers and we like to encourage making so what better way than to drive donations based on things that are made. The third reason is transparency. Anyone can check the entries thread on Ravelry to see how much should be donated whereas they would just have to trust us on the sales record. Not that we aren’t trustworthy but we want to make sure that there is no doubt where charitable donations based on activity is involved. Can I play on a team and individually? Can I play on two/five/ten teams? Yes. You can play however you want as long as you only enter each thing you make one time. Additional entries for the same handmade item will be disqualified. What is this themed stuff? It’s a way to get your nerdy, geeky, creative juices flowing. It’s just fun. I am submitting a thing I made for a swap on Ravelry and I don’t want that someone to know it’s for them! Can I still enter it? Yes. When you use the template to submit your entry just type “secret” in as your recipient then PM linuxchic on Ravelry with a link to your entry and who it is for. I won’t tell a soul but I might be really excited for them! I want to enter something so super secret that I can’t even post a photo, can I still enter it? The recipient isn’t required on the public post but a photo of the item is to qualify for prizes and donations to Project Linus. My brother-in-law asked that I make him something, would this something still qualify? It’s not really a gift or a donation, I’m just doing what he can’t. Anything made to give to someone else qualifies. Can I enter something that is sewn? Only Ravelry crafts are accepted. Your entry must be knit, crochet, woven or handspun or a combination of any of these crafts.